Australian detainee David Hicks has pleaded guilty at a military court at Guantanamo Bay to a charge of providing material support for terrorism. 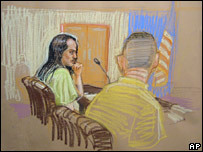 The 31-year-old Muslim convert was accused of attending al-Qaeda training camps and fighting with the Taleban. The plea means that Hicks, who has been at the camp for five years, is likely to return home to serve his sentence. Hicks is the first detainee at the detention camp to face terror charges under new US rules. He was charged under the new Military Commissions Act, which human rights groups condemn. Hicks appeared at the hearing wearing khaki prison fatigues and with hair down to his chest - grown, his lawyer said, to pull over his eyes at night to keep out the light and allow him to get to sleep. As the proceedings got under way, Hicks was formally charged and initially deferred entering a plea. But later on his lawyers told the judge he was pleading guilty. Other charges against him, including attempted murder, have been dropped. Prosecution and defence lawyers are expected to reach agreement this week on a plea deal establishing his sentence. US and Australian authorities have already agreed that Hicks will serve out his sentence in his native country. He faces a maximum sentence of life but after strong pressure from the Australian government there is speculation that he will receive a shorter sentence. Australian Foreign Minister Alexander Downer told local media that he welcomed the conclusion to a legal process which he said took "far too long". "My guess is he will be able to come back (to Australia) fairly soon," he told ABC radio. Before the hearing, which was opened to members of the press, Hicks was allowed a two-hour reunion with his father and sister. He last saw his father, Terry, at a previous hearing in August 2004. "There were handshakes, hugs and tears," Terry Hicks told journalists. "He looks bloody terrible." And Mr Hicks, who left the base before the plea was announced, said he would continue to support his son. "We will stand by him on anything he decides, whichever way it goes," he said. David Hicks arrived in Guantanamo Bay in early 2002 after being captured in Afghanistan a month earlier. The former farm hand and kangaroo skinner was charged and started a trial process previously in August 2004. However, the US Supreme Court last year ruled the system unconstitutional. The administration of President George W Bush then tabled a revised tribunal system that was passed by Congress. Hicks is the first person to be tried under the new procedures. Two others, Omar Khadr, a Canadian, and Salim Ahmed Hamdan, from Yemen, have been indicted but have not yet been read sworn charges, Cmdr Durand said. The US has said it plans to use the new system to prosecute about 80 of the remaining 385-or-so prisoners at the camp. Human rights campaign group Amnesty International has condemned the tribunals as "shabby show trials" and demanded that detainees be tried under the regular US judicial system.